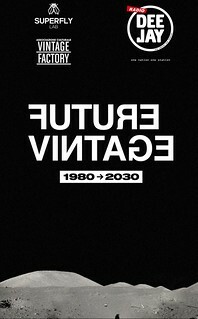 FUTURE VINTAGE FESTIVAL - Padova - 8th, 9th, 10th September 2017 - A.N.G.E.L.O. For eight years now the Future Vintage Festival has been a crucial appointment for fashion lovers looking for brand new visions investigating contemporary and future fusions between vintage, design, technology and communication. This edition's topic is "1980→2030", which will be the main focus of a weekend of meetings with important guests, exhibitions, concerts and nightlife events exploring new media and social and digital networks in the wonderful and modern location of Centro Culturale San Gaetano, in the heart of the historic centre of Padova. Once again this year, A.N.G.E.L.O. Vintage Palace, considered as one of the most influential vintage clothing shops in Italy and in Europe, will attend to the Festival and share with pleasure experience in the field. First, come discover our shopping corner with high-quality vintage clothes and accessories carefully selected especially for the occasion. Second, visit Orientalismi. From traditional kimono culture to Tokyo Street Style, the fashion exhibition curated by the A.N.G.E.L.O. archive with original, eccentric clothes and accessories straight from 1980s Japanese streetstyle, with pieces designed by important designers styled in super cool ouftits. Essential to your agenda if you love vintage and also wish to keep up with future fashion frends.